Somewhere between Jack Sparrow and Long John Silver is the world inhabited by Sylvestre de Greybagges, aka Greenbeard. You’ve heard of Blackbeard and Bluebeard, but Greenbeard is in a class by himself. Richard James Bentely’s Greenbeard seems to be set in the 18th century, but not quite the 18th century we all know. His is a parallel universe influenced by H. P. Lovecraft and Robert A. Heinlein, where everything is kind of familiar, but not quite as we remember it. Nods to such literary and historical figures abound in the novel as well as puns and delicious topical allusions which often threaten to become too self consciously clever as though trying too hard to be funny. 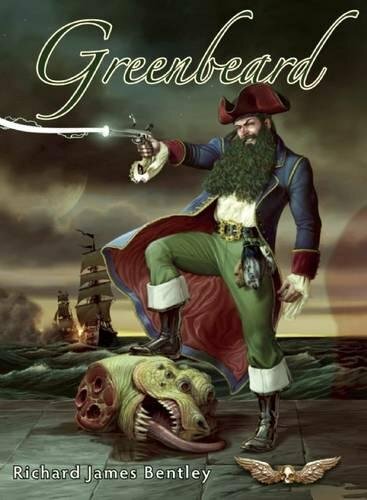 Greenbeard is, in short, a pastiche: a cross between science fiction, fantasy, horror, and the swashbuckler in a tongue in cheek, genre-bending adventure on the high seas—and the higher seas. Greybagges is a Cambridge educated lawyer who turned to piracy because it was more honest. Sailing the Carribean in his ship, the Ark de Triomphe, he is a striking figure with a beard as “lustrous and as yellow as Spanish gold” and long enough to reach his belt. This is before his beard turns bright green due to an unfortunate journey through a rift in time and space into a colony on Mars ruled by The Glaroon and his henchman Chtulu, who is really a rather charming chap in spite of the somewhat off-putting tentacles growing from his face. To the crew, the captain’s sojourn on Mars seems no longer than two weeks, but to him it is nigh on to two years spent working as the Glaroon’s slave before he is able to effect his escape. When he returns to them he sports a long beard of the most astonishing shade of green. It isn’t a proper beard at all, but tiny filaments, living creatures that have been painfully imbedded into his face. It is his plan for revenge against the Glaroon that is the core of the novel’s action. And in the service of his carefully plotted revenge he recruits a young bespectacled experimenter in the mysteries of electricity called Frank Benjamin. And when docked in an English city, here called “Liver Pool,” they have to pay protection money to that city’s two most notorious criminal gangs: The Lennons and the McCartneys. These aren’t the only things about this 18th century that don’t quite tally. His Master Gunner is Blue Peter Ceteshwayoo, an African and former slave whose skin is so black it looks blue in some lights. It might be noted that Blue Peter is the title character in a British children’s television show. In Mr. Bentley’s novel, Blue Peter’s principle ambition, aside from exacting his own revenge against his former master in Virginia, is to become a proper English gentleman. To that end, he affects proper English manners, but not really well. He comes off as a tad pretentious. Okay, very pretentious. “A-who? Zebras?” piped Bulbous Bill, his high pitched voice incongruously coming from so obese a body. As literate and learned men, Greybagges, Benjamin, and Blue Peter speak often to each other about philosophy and ethics—interesting in their own rights, but also providing the basis for the chief criticism of the novel. Such long discourses threaten to interrupt the action to the degree that we often have to remind ourselves just what the plot of the novel is. Playwrights are cautioned against including anything in their scripts that does not further the action, which is defined as a conflict in the process of resolution, and while the novelist has some more leeway, he shouldn’t indulge it too much. These digressions are not uncommon in 19th century literature but could seem tiresome after a while today. When the preparations are accomplished, the ship fitted out with Mr. Benjamin’s miraculous electronic machine, and the journey to Mars is begun, Greenbeard morphs into a thrill a minute ride with enough surprises and twists to satisfy even the most enthusiastic fans of such similar fare, like Doctor Who. Greenbeard is science fiction with a sense of humor. The Ark de Triomphe does carry Greybagges to where he can achieve his ultimate revenge on the Glaroon and The Great Chulu, in the process having to defeat such outré creatures as the Toad Men who are dumb as fence-posts but obedient to a fault, the Lizard People who have no taste for war and would just as soon not fight at all, and at last “The little grey buggers” who are just plain nasty!